The way I work is not “industrial.” I don’t grind out a release in one complete chunk, release it into the “market” and then leave it behind forever. I tend to circle back. Revisit. Repair and refurbish. Embroider. Improvise variations. Document process with more process, comment upon comment. Ideas become themes. Themes become stories. It is more like weaving a tapestry than setting a production line in motion. And good weaving takes Time. Lately, I’ve become more aware of other creators in Second Life who work in similar ways, in spite of the pressure, and I find it refreshing and reassuring. Not that I need validation to continue working the way I do, but their persistence is, nevertheless, encouraging and reminds me that I am not alone. And that is a good thing to remember. 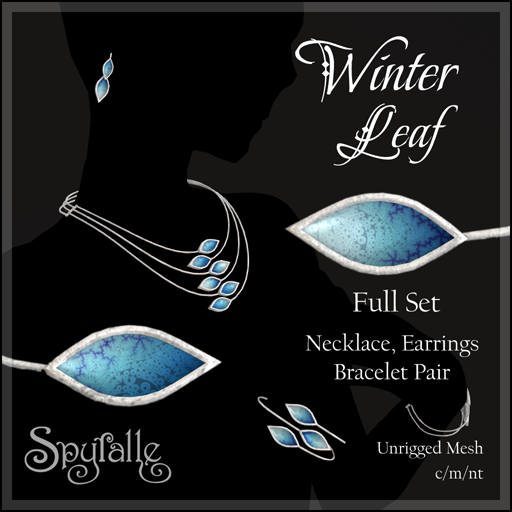 Winter Leaf is Spyralle’s exclusive at Midwinter Fair, presented by Redeux, ending today. Summer Leaf is still available at Spyralle Park Place. Autumn Leaf and Spring Leaf have been on temporary hiatus awaiting Winter. And now it’s here! The other current event on Spyralle’s Calendar is Gothic Garage Sale IV, presented by Dark Passions, running through 3 February. The Garage Sale is exactly what it sounds like – high quality products, new and old, from great designers offered at a discount of 50% or more. There’s also a 5L hunt! For the hunt I made a companion set to the candles in the Team Diabetes event hunt this past Halloween. Speaking of revisiting ideas … This is another project “tree” (sorry) I keep cultivating. I created a series of meshes, so far mostly candlesticks, designed to make use of some of the hundreds of kaleidoscope fractals I’ve created. They’re absolutely unpredictable because they only use a portion of the image, and when you rotate the image, you get a completely different pattern on the mesh. It’s kind of like making the original fractals, in a way. Favorite color scheme, too! My principle release at Gothic Garage Sale is something I was pretty excited about – and exclusive to the event, though it is a re-release (!). I finally updated the Dark Artifacts tattoo/face jewelry set with Omega appliers (plus other little fixes and improvements). This is out for the first time at the event. The photo was taken of a system avatar, but the tattoos were tested on several Omega compatible heads. The pattern is a fractal spiderweb. And that hair (isn’t it cool?) is KGI848 from booN, worn with one of their hairbases. A lot of their styles feature creative and unusual hairpieces worn with an applied hairbase – great for the big headpieces! The bases are sold separately from the hair, but the hairpiece usually comes with a recommendation for the right hairbase. I had not been to booN for a long time, so I ran to check and see if they’re still there, and they are!, though I think this is a different location from the last time I visited. The hairpiece worn in the picture above is now called Lab.013. I did not see Omega versions of their original hairbases, which match their hair colors, but they do have appliers for 6DOO heads, a brand that is not familiar to me. If you use a mesh head, you may have to use the hairbases made for that head and try tinting. 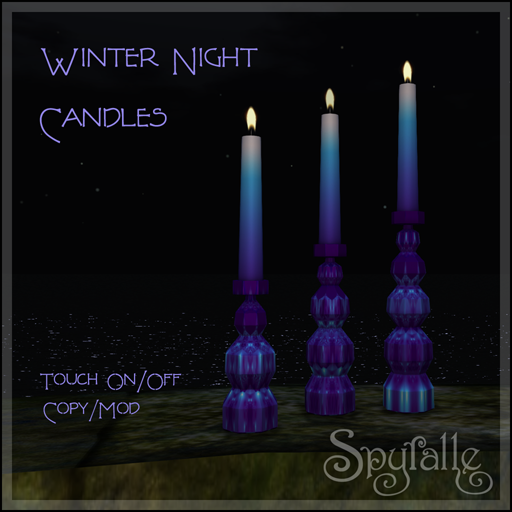 This entry was posted in Events, Hunts, New Release and tagged BooN, fractal, Goth, Hunt, Jewelry, Spyralle, tattoo. Bookmark the permalink.